Mission Creativity: What a weekend! Wow, I had a weekend! I spent most of Friday running errands, doing homework, and working. I decided a night of pj's was necessary in preparation for Saturday. The weather has been absolutely sunny lately, so after work on Saturday, Dan & I took a bike ride along the beach. 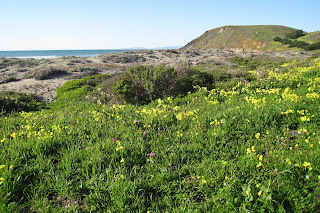 All of the wild flowers are starting to bloom and make our green land more colorful. We rode our bikes to meet Jessica at Starbuck's to catch up for a while, but after the sun went down it got cold. We moved it to my house and chatted about Twilight while Dan went for a test drive in my Uncle's new car. 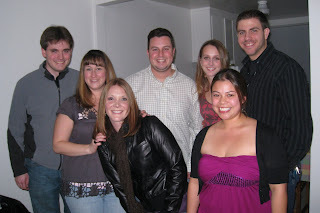 Then we all headed over to Kelley's apartment to meet up for Jenna's night out celebration. We drove to the Steelhead Brewing Company in Burlingame for some dinner and drinks. We followed that up with some dancing at the Vinyl Room. It turned out to be 70's night so a bunch of people were wearing Afros and crazy outfits. We danced until the music slowed down and then called it a night. Yesterday was an incredibly great day for me. I got a lot of positive feedback about my recent common sense lo I did for scrap mojo. I was given a bag full of Hershey kisses (love chocolate), found great deals at Michael's near my work, and then Kristi surprised me by dropping off some stuff I'd ordered with her. 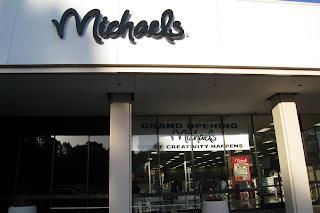 And if that wasn't enough, I went to the Grand Opening of Michael's near me. The closest one is a 30 minute drive one way. Now I have a super store just 15 minutes away! The store is bigger than any Michael's I've ever been to. I love how organized it is and all of the great products they carry. They even have American Crafts albums! 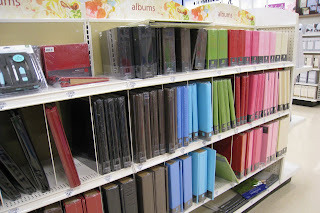 I was so excited, I took a video of the scrapbooking section. And it shows 1/4 of the scrapbooking area in the store. I ran into quite a few people that I know and that was fun too. My mom even joined me so we could get two items at 50% off. I'm still on a huge shopping high. It's a safe assumption that I'll be stopping by at some point today, with Jenna, to use another coupon and score some more stuff that I saw. Of course I enjoyed myself after at Dan's house too. We watched My Super Ex Girlfriend. I laughed so hard at some of the stuff that was in that movie. I love movies on tv, good deal! 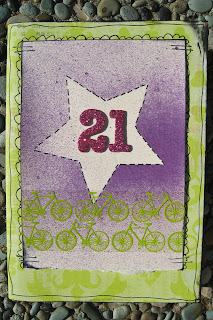 And now, I leave you with Jenna's birthday card that I made for her 21st birthday. oh this looks like a lot of fun! Ohhhhh I'm so jealous of your awesome Michaels!! mine looks no where near as cool as that. I would actually want to shop at that one! Don't know any "Michaels" in Holland but those photo's got me jealous!! !